Once the first touch of Fall comes, everything becomes Pumpkin Flavor! From grabbing a drink at your local coffee shop to creating exciting desserts, entrees and smells for your home. Nothing like football, a touch of Autumn, the first red leaf falling from the trees, Halloween, baking, warm fires and cozy nights. Enjoy the touch of Autumn with this Pumpkin Bars Recipe with Cream Cheese Frosting. Beat Eggs and add sugar, oil, and can of pumpkin. Bake 350 Degrees for 25- 30 minutes. These are yummy warm or cold but imagine them heated with a sweet touch of sugar, vanilla and cream cheese frosting. Spread with the delicious recipe below. Mix cream cheese, butter, vanilla, and sugar until blended well. Spread evenly onto pumpkin bars and enjoy! If you like the Pumpkin Bars Recipe, don’t forget the Pumpkin Soup Recipe! Absolutely delicious! Find more Recipes on Frugal Coupon Living including the Freezer Weekly meals with Weekend Prep and the Fall Recipe Round-Up. I love pumpkin! This looks great! Come link up and share!! Your pumpkin bars sound delicious! I’ve been making lots of pumpkin recipes since September started and want to try some new ones!!! 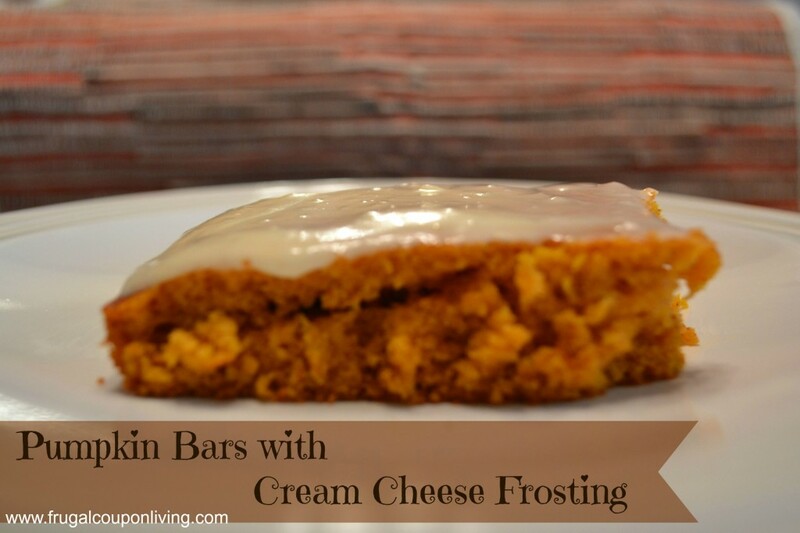 These bars sound really good, especially with the cream cheese frosting! These Pumpkin Bars look amazing, wish I had one right now. Hope you are having a great weekend and thank you so much for sharing with Full Plate Thursday. Love your site! So glad to find it! Looks like a great one to follow. I popped over from the Wake Up Wednesday Linkey. Thanks for posting there! Come visit me sometime! Deb @ Kneaded Creations.